Kottayam is beautiful with some of the most enchanting natural scenes in God’s own country. Panoramic backwater stretches, lush paddy fields, highlands etc. give this district an enviable position. Situated on the lap of Western Ghats bordering Ernakulam on the North, Idukki in the East, Pathanamthitta in the South and Alappuzha in the West Kottayam is also rich with backwaters. Kottayam, the land of letters, latex and lakes is the first district of Kerala that achieved 100% literacy. Kottayam is the richest district in Kerala for agricultural commodities like spices, rubber and coconut. The rubber board one of the first commodities boards of the country is situated in the Rubber Town of Kottayam. The first Malayalam printing press was established in Kottayam district by Benjamin Bailey, a Christian missionary, in 1820 AD. Kottayam is also known as the Mecca of publications. Many newspapers and magazines which include Deepika, the first newspaper in the state, Malayala Manorama, the leading newspaper in the state, Mangalam etc are published from the land of letters. Kottayam is the ideal take-off point for visits to Peerumedu, Munnar, Idukki, Thekkady, Ernakulam and the temple city of Madurai. Rail: Kottayam is well connected with the major towns in and outside Kerala by an extensive rail network. Road: Long distance buses operate from the KSRTC Bus Station, Ph: 0481 2562935, 2562908. Anchuvilakku:(22 km from Kottayam) This stone lamp post, a fine example of Kerala’s Architecture, was built near Changanassery boat Jetty by the renowned freedom fighter Veluthambi Dalawa. The 5 lamps on this post are lit using kerosine. Karimbukayam: This quaint spot on the Manimala River is much sought after for its natural splendours. The river flows between Kanjirappally and Erumeli Panchanyaths. What make the place really popular are the exotic water fiestas on the reservoirs organised by the enthusiastic people. Aruvikuzhi Waterfalls:(18 km from Kottayam town) Two kilometers down Kumarakom is this beautiful picnic spot where streams tinkle as it penetrate to the landscape and water roars as it cascades down the mountains from a height of 100 feet. Nattakom and Panachikadu Reservoirs: Adding to the charm of these salubrious and tranquil villages are their scenic reservoirs, escorted by vivid green all along. Migratory birds flock together seeking this verdant landscape during every summer and frolic in the natural splendours of the end of the season. Kumarakom: (16 km from Kottayam) This tiny unbelievably beautiful paradise of mangrove forests, emerald green paddy fields and coconut groves intertwined with picturesque water ways and canals adorned with smiling innocent lillies is famous extra terrestrial. Lying calmly on the lap of Vembanad Lake one will come across in this small water world a lot of traditional country crafts, houseboats and canoes. A cruise monotonous in a houseboat through the sapphire melted backwaters of Vembanad Lake is an ecstatic experience. Kumarakom Bird Sanctuary: (16 km from Kottayam town) An ornithologist’s paradise, Kumarakom Bird Sanctuary on the banks of the Vembanad Lake is a favourite haunt of migratory birds like the Syberian stork, Egret, Darter, Heron and Teal. Pathiramanal: Pathiramanal is a 10 acre island on the backwaters which houses many rare varieties of migratory birds from different parts of the world. Pathiramanal can be accessed only by boat. Thangalppara: The mausoleum of Sheikh Fariduddin found here makes this place a famous Muslim pilgrim centre. Kayyoor:Kayoor is an exciting landscape with green hills at Bharananganam Panchayath. A shrine where only ghee is used to light the lamps like the famous temple Sabarimala dedicated to the Pandava brothers of Mahabharatha is found here. Women are not allowed inside the temple. Vaikom Tourist Land: Vaikom is a quite picnic spot ideal for a languorous break. Various recreation facilities available here add the elegance of land. Vaikom has also importance in the contemporary history with Vaikom Sathyagraham which is blessed by Mahatma Gandhi to get entry for Harijan Hindus into the temple in 1925. Vaikom Mahadeva Temple: (40 km from Kottayam town) This is one of the major temples of India and the most acclaimed Siva temple in the South. Vaikom Mahadeva Temple is believed to be the second version of Kasi. Erumeli: (60 km north-east of Kottayam town) Erumeli is a pilgrim centre. This is the entrance point to the Sabarimala Temple, the most prominent pilgrim centre in South India. This nature rich village is nestled in the lush green Western Ghats. Kurisumala: (3 km from Vazhikadavu) The peaceful monastery at the top of the hill, the silence of the hill, the cool mountain air and the green landscape are all fascinating. This is a renowned Christian pilgrim centre where hundreds of devotees from far and near converge during the holy week and after to climb the hill carrying wooden crosses. Vavarambalam, Erumeli: A mosque, dedicated to Vavar, companion of Sree Ayyappa, the presiding deity of Sabarimala. This mosque is very significant because Hindu Pilgrims customarily worship here before trekking to Sabarimala. Maniyamkunnu: The majestic mountain here that slops down to meet the beautiful valley below is really spellbinding. The panoramic sceneries of the place are exciting. Illikkal Mala: Illikkal Mala is 6000 feet above sea level. Numerous mountain streams in this peak flow down to form the serene Meenachil River. Tourists have to trek up 3 km to reach the top of the hill. Illikkal Kallu: Three hills, each rising to 4000 feet and above, together form this huge hill. Each of the hills has a peculiar shape. The sunset from these rocks is really a sensational view. Nadukani: The lovely location at the top of hill with endless stretches of meadows girded by huge rocks. A bird’s eye view of the low lying lands can be enjoyed from here. Marmala Stream: This scenic stream and its waterfalls are sights unique, sliding down numerous hillocks from a height of 200 feet. The gushing water has etched out a deep pond in the rocks. A natural bridge is there under the waterfall. Kannadipara: Bamboo groves, meadows and wild flowers make this place exotic. As the name points, the valley of this rocky mountain reflects the morning sun with a mirror like perfection. An added attraction of this beautiful place is the Kazhukankulimali waterfalls that playfully cascade down the mountain and greet the river below with a magnificent splash. Poonjar Palace: (47 km from Kottayam and 18 km from Palai) This is a glorious testimony to the regal opulence of a past. Within the royal palace walls is an extraordinary royal collection of antiques and exquisite furniture. Ettumannur Mahadeva Temple: (12 km North of Kottayam) This temple is famous for its murals especially the paintings of Nataraja in the Gopuram and Ezharaponnana. Ilaveezhapoonchira: Ilaveezhapoonchira means valley where leaves don’t fall. The verdant landscape punctuated by four gigantic hills, each rising to around 3200 feet, is an ideal place to unwind. Adityapuram Surya Temple: (15 km North of Kottayam) The only temple in Kerala dedicated to Aditya, the Sun God. Raktachandanam is the special Prasadam of this temple. Kottathavalam: According to legends the royal family from Madurai rested here on their way to Poonjar. The rocks within the cave carved like chairs and couches and the figures of Madurai Meenakshi, Ayyappa, Murugan, Kannaki and weapons sculpted on them are all worth exploring. Ayyappara: Legends explain that the five Pandava Brothers, heroes of epic Mahabharata, stayed near this rock, 2000 feet above sea level, during their exile. The name is said to be the modification of the original term Anchupara (five rocks). Bharananganam, St. Mary’s Church: The mortal remains of the Saint Alphonsa (1916-1946) are kept at this church which is now a famous pilgrim centre. This holy shrine is crowded by the devotees when it celebrates its annual feast (the feast of the Saint Alphonsa) in July. Kesari Falls: Kesari Falls is also known as Valanjamkanam falls between Kuttikanam and Murinjapuzha. Kesari Falls offers adventurous spirit and closeness to nature. Vazhikkadavu: This hill station is one of the many beautiful picnic spots with pristine beauty of nature. One side is tall with steep rock and the other is valley with fearful depth. During December/January the landscape is coloured with orchid and wild flowers. Mankallu Mudikal: With no trees around the three hills which lie close to each other give a feeling of walking in the clouds. The scenic pictures from the hill are enchanting views. Cheriapalli, St. Mary’s Church: (2 km from Kottayam town) The church is built in 1579 by Thekkumkoor Maharaja and displays outstanding architecture which is a blend of Kerala and Portuguese styles. Biblical and non-biblical themes are depicted on the walls. Thalikkotta, Siva Temple: (2 km from Kottayam town) Thalikkotta Siva Temple was the place of worship of the Thekkumkoor royal family. The temple attracts many pilgrims with its architectural style. Kanjiramattom Mosque:(2 km from west of Kottayam town) This church, built in 1550 AD, belongs to Knanaya Orthadox Syrian Community. The Persian Cross, believed to be one of the seven brought here by St. Thomas. The church is also famous for Pahlavi inscriptions. Thazhathangady, Juma Masjid : (2 km from kottayam town) This ancient mosque is believed to be 1000 years old. Thazhathangady Juma Masjid is one of the oldest in India and situated on the banks of Meenachil River. Thirunakkara Mahadeva Temple: In the heart of Kottayam town is this 500 year old temple built by the Thekkumkoor Maharajah. The Koothambalam, the special building in the temple premises used for cultural purposes, is one of the best in Kerala. Pazhayapalli, Changanacherry: (21 km from Kottayam) This 950 year old mosque is the most famous one in Central Travancore. The annual festival, Thangal Adiyanthiram, is well known and is marked by a grand community feast of all religions. Aruvithira Church: Believed to be one of the seven churches established by St. Thomas. This is also one of the churches in Kerala which collects the largest amount of monetary offerings during the festival days. St. Thomas Mount: This holy place of Christians is located 1200 feet above sea level and offers a panoramic view of the Vaikom Lake and the surrounding areas. Kuravilangad, St. Mary’s Church: Built in 355 AD on the high ranges of Kuravilangad town, this church has an old bell which bears an undeciphered inscription. CSI Cathedral Church: Built over 175 years ago, is a monument from the British Era. Puthupalli, St. George Church: This church is believed to have been built by the Thekkumkoor Rajas. The golden cross in this church is well known. Athirampuzha, St. Mary’s Church: This church was built in 1080 AD and was renovated in 1874. Manarcad Bhagavathy Temple: Centuries old temple dedicated to the Goddess Bhadrakali. Vimalagiri Church: This church is built in the Gothic architectural style. Pala, St. Thomas Church: The church dates back to 1002 AD and was renovated once in the 18th century. Vagamon: Vagamon is trekker’s paradise. Vagamon, at the elevation of 1100 meters above sea level on the Idukki-Kottayam border is beautiful with tea gardens and meadows. 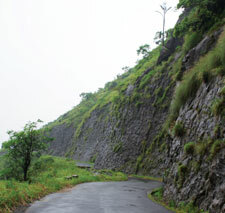 Vagamon offers many holiday attractions throughout the year except during the monsoon season. The breeding centre of the Kerala Livestock Board located here. Kudamaloor, St. Mary’s Church: This church 800 years old, was built by Chembakasseri Maharajah. Erattupetta Puthenpalli: This mosque is famous for the feast Chandanakudam celebrated in February / December. Ambalakkadavu Bagavathy Temple: The Arattu Ritual of the Thirunakkara Mahadeva Temple takes place here. Mannanam, St. Joseph Monastery: (8 km from Kottayam) This monastery is famous and associated with the name of Blessed Father Chavara Kuriakose Elias. It is an important Christian pilgrim centre. The mortal remains of Father Chavara Kuriakose Elias (1805-1871) is preserved in this Holy Monastery. Kaduthuruthi Valiapalli:Built in 500 AD, the church has a huge cross sculpted out of a single stone at the entrance. Kavil Devi Temple, Chaganacherry: Built by one of the Thekkumkoor Maharajas. Perunna Subramanya Temple: Pallivetta utsavam is the famous festival here. Cherpungal, St. Thomas Church: Believed to have been established by the apostle St. Thomas. Panachikkad Saraswathi Temple:This temple, also known as the Mookambika Temple of the South, holds the Saraswathi, the Goddess of learning and the arts as the presiding deity. Vazhappalli Siva Temple: (17 km from Kottayam) This Siva temple is famous for its sculptures and situated near Changanacherry. Vazhappalli Kalkulathukavu Temple: This temple is famous for its Mudiyeduppu Utsavam celebrated once in 12 years and the rare art form connected with it. Manarcad St. Mary’s Church: (8 km from kottayam) This is one of the most important churches of the Malankara Jacobite Syrian Christians. The 8 days fasting from 1st to 8th September gathers thousands of devotees from the different parts of the country. Pakkil Dharmasastha Temple: (3 km from Kottayam) This temple is said to be one of eight temples established by Holy Sage Parasurama. kerala-kerala kerala-hotels in in-tourism in kerala-cheap hotels-tour packages-munnar-tour packages-honeymoon pacskages-travel packageskerala kerala-tourism travel-accommodation.